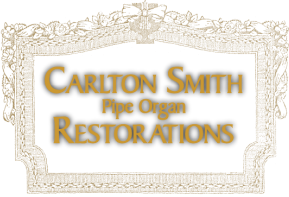 Carlton Smith Pipe Organ Restorations is a company devoted solely to the restoration and preservation of the Theatre Pipe Organ, a uniquely American invention. ​These musical instruments are the original concept of today's orchestral keyboard and are very different from their counter part, the classically designed church organ. Our company works hand in hand with assisting historic theatres, auditoriums, private studios and residences with the restoration or rebuilding of existing instruments as well as with the acquiring of, assembling and installation of new instruments. We place a high regard on our installations being carried out in the historically correct manner of the original manufacturer. We perform all of our work with the highest quality of craftsmanship.